My friend Joyce passed away last night. It was not unexpected. “Death is part of life and I don’t fear it”, she said. Fortunately, I got to say goodbye to her a few weeks ago. She was so peaceful and so accepting. That makes her passing so much easier. I’m not sad; I’m happy and lucky to have known her. I met Joyce probably 15 to 20 years ago when she became involved with the Boulder County Nature Association. I’ve gone on hikes with her, taken nature classes she taught, and for a few years we attended the theater with other close friends. 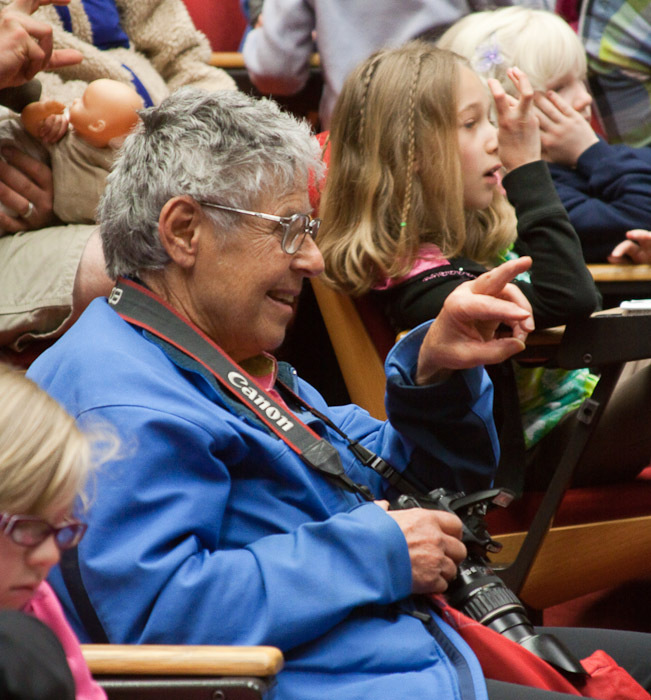 Joyce has spent her life learning and teaching aspects of the natural world. 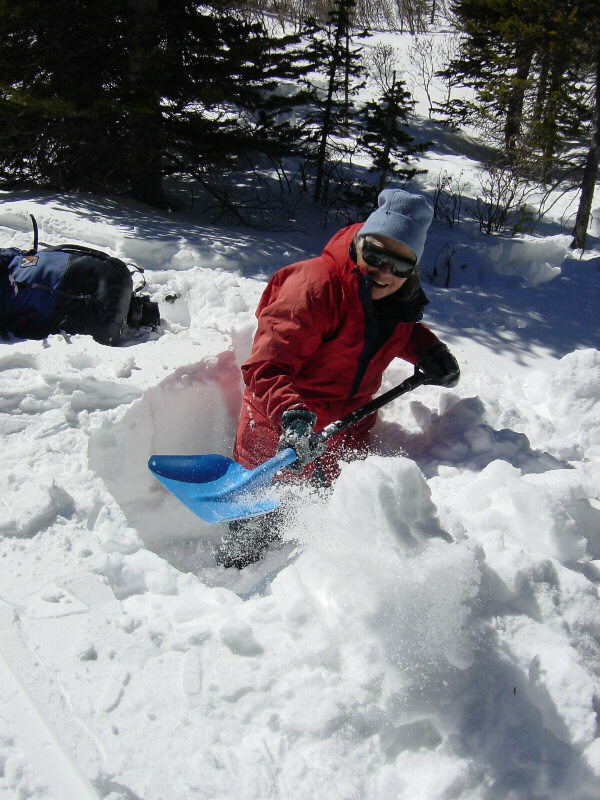 Joyce happily digging a hole to show us the different layers of snow. Winter Ecology class, March 2002. She had been fighting cancer for several years and succeeded at least temporarily. When her cancer returned, knowing the end was near, she went to Bhutan and trekked over 80 miles. It’s these qualities–an intense love affair with the natural world coupled with forward-looking optimism and physical resolve–that have enabled Joyce to survive the premature deaths of two sisters, a brother; and a son; desertion by a husband of 26 years; and two bouts with cancer. They’ve inspired her to conduct groundbreaking research in the lives and adaptations of aspen trees, write poetic books about white-tailed ptarmigan and the alpine life zone, and introduce several thousand students, age 5 to 85, to field ecology. Here is another recording that was done the same morning prior to the one above. It’s the monthly installment of the Nature Almanac that is broadcast on KGNU. Steve is the host and Joyce is one of the guests. Nature geeks in action. In 2002, she wrote a book Song of the Alpine. I pulled if off my shelf this morning and I think I’ll begin reading it again. I’ve taken thousands of photos, but my friends rarely make it into the photos. Maybe I should take some nice portraits of my friends. Here is the most recent photo I took of Joyce in April, 2010. It’s people like Joyce and Steve that help me to be the nature geek I am. The first clip made me cry, especially hearing her labored breathing, and her wobbly voice. It’s hard to listen to someone talk about their life when it’s so close to being over. I’m sorry you’ve lost such a friend, though as you said, you were lucky to have known her. I’m sorry it made you cry. I probably should put a warning above it. I hope it didn’t dampen your day. I thought it was just me because I knew her. I have since learned both audio clips were recorded the same morning. The clip for the radio was recorded first and the other one was recorded as they were hiking back up to the car. That was partially why her breathing was labored, it was up hill. You said the clip was difficult, I just didn’t think it would be that difficult. Didn’t dent my day, just added another layer. (I see you’ve added the caution. No doubt this is inappropriate, but that makes me smile). She sounds like an amazing woman. I’m sorry for your loss. I am sorry you have lost such a good friend, it is never easy, even when it is time. I flew up to see Leslee a few weeks before her death, her passion was horses so I went to see her “baby” after the funeral. I listened to the clips, your friend had a good spirit, must have been difficult for those who knew her to listen to them. I think some people enrich our lives, not just in how they live their own, but also in their death. Leslee was one of those, and it sounds like your friend Joyce, was another. Thanks Liz. Yes, I think the way Joyce handled her bouts with cancer and her death was inspiring for me. She was pragmatic which also gave her peace. Thank you for posting this and including the podcasts so we could hear Joyce’s voice. I met her when she came to a couple writing seminars I taught, and then I got to spend 6 days on the river with her. She was truly a remarkable woman and inspiration to us all. Thank you. thanks so deeply for this. i was with joyce the day before she died and was still so deeply inspired. i’m her friend working on the book “Aspen Dreams : A Memoir” with her, doing the design and layout and illustrations…and worked with her on the video as well, about ptarmigan. I miss her deeply, but she left so gracefully and she was ready. much love. I can still hear her laugh. We sell Song of the Alpine at my work and I’ve been meaning to get it. Now, I have another reason. Thanks for the great article and sound clips. Joyce was my biology teacher at Boulder High School. She is one of the main reasons I became a science teacher. Fortunately, I had a chance to tell her that. While in high school, she took us on a ski field trip up Niwot Ridge. I remember it as if it was yesterday. When we were finished, we went to her house near Ward for hot chocolate. We should be so lucky to live a life such as hers. Thank you for the audio, stories and pictures. Hi Scott; Thanks for sharing. It’s great to hear she influenced you into becoming a science teacher.